With great joy, last January we completed the 2014 Intensive Yoga Teachers Course amidst the beautiful and serene mountains of the Córdoba Province, Argentina. 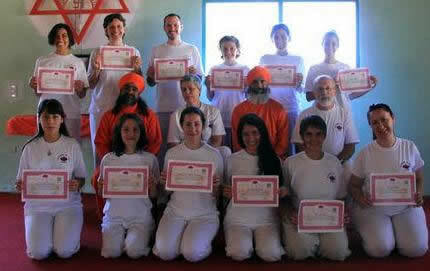 This year thirteen people got their Yoga Teacher Certificate after passing excellently the theoretical and practical exams. Every year we feel the joy of sharing this deep experience of transformation, very difficult to explain in words. It is exciting to participate in the training of these people, knowing that each of them has added to their life several new and positive habits and skills, and that they bear the hopeful message of yoga and spirituality to many people in need, worldwide. 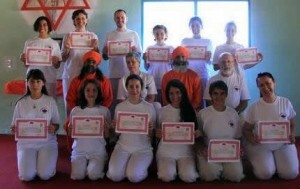 The course was held in an atmosphere of camaraderie and deep commitment. Students showed great interest in each of the topics and engaged in strong bonds of friendship and trust. This course is a great challenge for everybody; seventeen days of immersion and absolute dedication, away from home, family and daily routine, in a new environment and sharing every moment with people previously unknown. Activities begin at five in the morning and extend until shortly before dinner. But all the physical and mental effort is amply rewarded with the results. For us, as educators, it is encouraging to see that every year more and more people are interested in actively participating in social change toward a new era of higher consciousness and spirituality. The great effort made by our students to participate in this course, is proof of their genuine commitment and dedication. Certainly our world needs many people in this category, in this difficult era of moral and spiritual crisis. We sincerely hope to continue every year with this activity and thus make our small contribution to the social and spiritual change that we all expect. We know that this work is not our merit, but of all those who came before us, inspired us and taught us. And especially it is the merit of people that every year trust us and make this wonderful experience possible. We express our deepest and sincere thanks to all. And finally, our greatest gratitude is undoubtedly to the great philosopher, humanist and social reformer Shrii P. R. Sarkar, whose teachings are the base and perennial inspiration of this and many other educational and service projects around the world.